One of my favorite wallet designers is actively giving discounts through Twitter. I’ll try to stay on top of the deals and the discount code to use. 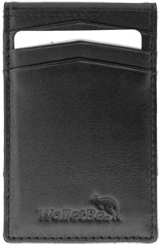 This weekend, coupon code TW311 on Twitter saves 25% on all men’s and women’s wallets. These wallets are designed by Jim Dimataris in California. His company, WalletBe, has been a fixture on QVC for 10 years and I think at this point, his site says that 1 in every 300 Americans owns one of his wallets. The quality is amazing. I’ve had my Front Pocket Wallet for years and I just keep buying them as replacements for the future or as gifts for friends and friends. He buys his leather in the US and has it tanned by real Italian artisans in the Tuscan mountains. And the price point is ridiculous. I paid $21 for mine.